March is National Nutrition Month, and the theme for 2016 is "Savor the Flavor of Eating Right and Eating Right For Your Lifestyle." Eating according to the Mediterranean Diet is a great way to do exactly this. 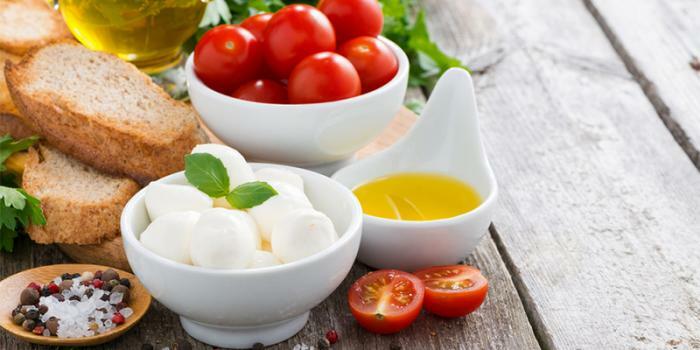 The Mediterranean Diet has been around for many years and is based on the traditional foods eaten in the 21 countries bordering the Mediterranean Sea, including Greece and Italy. You can modify the diet to fit your lifestyle, as long as you incorporate all the important food groups into your daily meals. The foods in this eating plan are not only healthy, but they are also real foods that taste good and are satiating. Research shows that the Mediterranean Diet lowers the risk of cardiovascular disease and stroke by as much as 30%. People who eat according to the plan are 13% less likely to develop memory and thinking problems. The diet also helps lower inflammation and lengthen your life, and it promotes weight loss and management too. Vegetables: High in nutrients and fiber while low in calories and fat. Aim for at least 3-4 servings per day and choose a variety of veggies in many different colors. Fruit: Good source of vitamins, minerals, and antioxidants. Aim for 2-3 servings per day and choose a variety of fruits in all colors of the rainbow. Fish: Good source of omega 3 fatty acids, protein, and nutrients. Aim for enjoying fish at least 1-2 per week, but avoid eating fish more than 3 times per week due to the risk of high mercury levels. Beans: Great source of fiber and nutrients. Beans are a healthy carbohydrate that are high in protein, potassium, and magnesium. Enjoy beans in salads, entrees, and soups. Whole Grains: Healthy carbohydrates like quinoa, amaranth, farro, brown rice, whole wheat pasta, sweet potatoes, whole grain sprouted bread are all great whole grains. Olive Oil: Healthy fats such as olive oil, avocados, nuts, and seeds are key to this diet. Herbs and Spices: Use a variety of herbs and spices and cut down on salt. Other foods that you can enjoy in moderation are red wine, which is rich in antioxidants, lean meat, eggs, cheese, and dairy. Eat real foods, minimally processed food and practice portion control too.